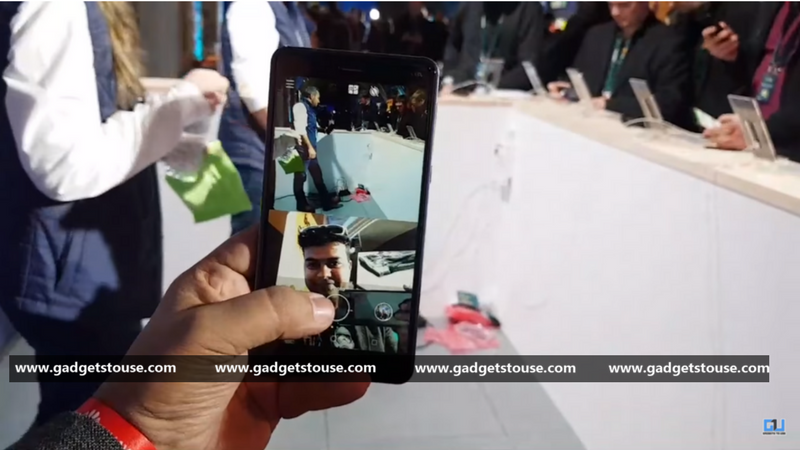 #GTUMWC2018 Nokia 6 (2018) was launched at Nokia’s launch event ahead of MWC 2018. 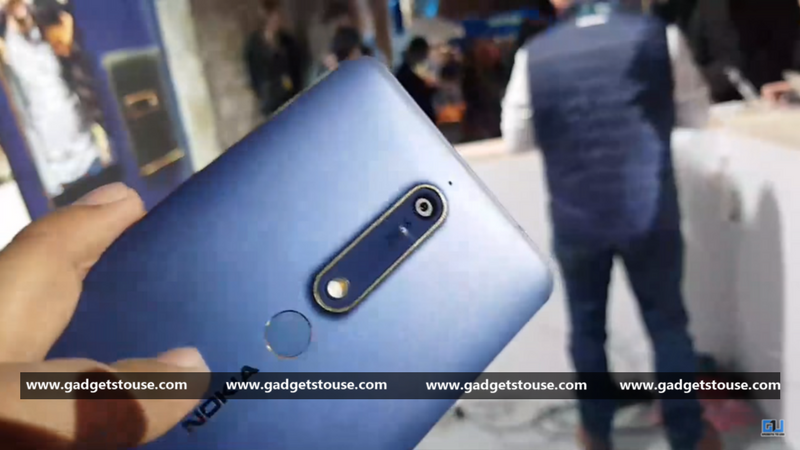 The new Nokia 6 smartphone was unveiled earlier this year in China, however, this global variant of the same device comes with Android One program, so it runs the latest Android Oreo. HMD Global has partnered with Google and all its smartphones launched at MWC 2018 come with the latest Android Oreo experience. So, this is the only highlight of Nokia 6 (2018) which was launched in China with upgraded hardware in comparison to its 2017 edition. The smartphone also sees a few design changes as well such as the fingerprint sensor has been moved to the rear panel – instead of below the display. 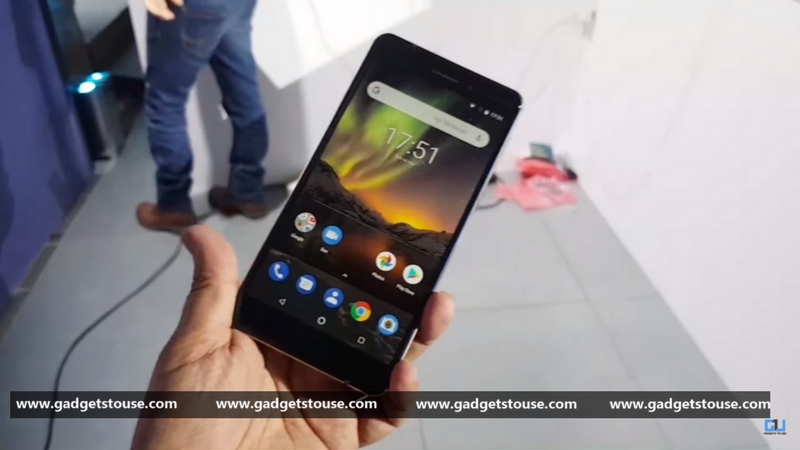 Here are our first impressions about Nokia 6 (2018) Android One phone. The Nokia 6 (2018) comes with a similar design as the earlier version with a minor change. This time HMD Global has opted for on-screen navigation buttons and the bezels look bit smaller because of this. However, there is still a 16:9 display. 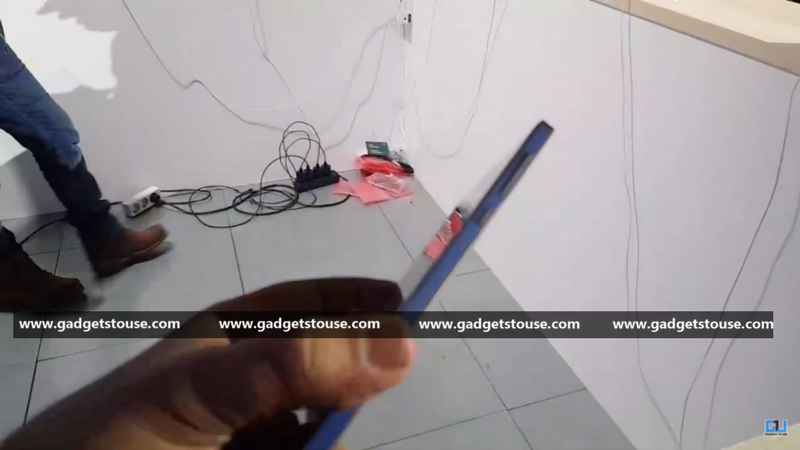 Moreover, Nokia has moved the fingerprint sensor on the back of the smartphone. The phone is made of series 6000 Aluminium. The new Nokia 6 (2018) smartphone sports a 5.5-inch FHD (1080×1920 pixels) IPS LCD display complete with Gorilla Glass protection. Sadly, it is the similar 16:9 aspect ratio display that we have seen last year on Nokia 6. The back side of the phone sports a metal body, camera module, dual LED flash and a fingerprint scanner below it. There are Nokia and Android One branding on the bottom side. The smartphone will come in three variants with Black/Copper, White/Iron and Blue/ Gold color options. The right side of the phone sports power and volume buttons, while on the left side there is a SIM card tray. On top, there is a 3.5mm audio jack and USB type C port and single speaker grill is placed at the bottom. The Nokia 6 (2018) runs Android 8.0 Oreo out of the box. 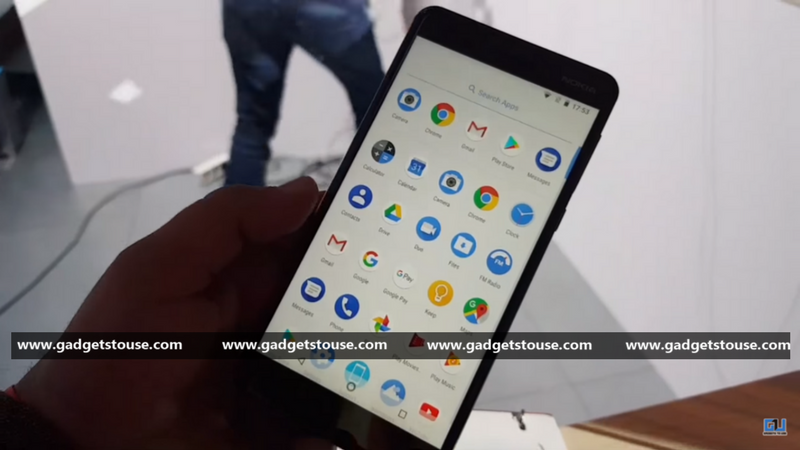 As we mentioned, the smartphone is an Android One phone so it comes with the promise of stock Android experience and swift software updates from Google. It is also slated to get the next Android P as well. The new Nokia 6 smartphone features the 16-megapixel rear camera as Nokia 6 2017 edition. The Zeiss optics camera comes with PDAF, a f/2.0 aperture, 1-micron pixels, and dual-tone LED flash. On the front, the Nokia 6 (2018) sports an 8-megapixel fixed focus camera with a f/2.0 aperture, and 1.12-micron pixel size. The new Nokia 6 also offers the Bothie feature of the Nokia 8. In terms of performance, the Nokia 6 (2018) runs on Qualcomm Snapdragon 630 processor coupled with Adreno 508 GPU. The smartphone has 3GB RAM+32GB storage or 4G RAM+ 64GB of inbuilt storage options. The storage is expandable via microSD card up to 128GB. The octa-core processor is good enough for moderate usage. Question: How is the display of Nokia 6 (2018)? Answer: The Nokia 6 (2018) comes with a 5.5-inch IPS LCD display with FHD (1080p) resolution and a 16:9 aspect ratio, protected by Gorilla Glass 3. Question: What is the Android version runs on Nokia 6 (2018)? Answer: The new Nokia 6 runs stock Android 8.1 Oreo, and it is a part of Google’s Android One program. Question: Which is the processor powering the Nokia 6 (2018)? Answer: The phone is powered by an octa-core Snapdragon 630 chipset. Answer: The Nokia 6 (2018) comes in two variants- 4GB LPDDR4X RAM and 64GB internal storage, and 3GB RAM with 32GB storage, with support for microSD cards up to 128GB. Question: What is battery capacity on the Nokia 6 (2018)? Answer: The Nokia 6 (2018) comes with 3,000mAh battery and it can deliver up to 16hrs talk time. Answer: The Nokia 6 (2018) comes with 4G VoLTE, Wi-Fi 802.11ac, Bluetooth v5.0, FM radio, GPS/ A-GPS, USB Type-C (v2.0), and a 3.5mm headphone jack. Question: What sensors are used in Nokia 6 (2018)? Answer: Sensors on board include an accelerometer, ambient light sensor, digital compass, gyroscope, proximity sensor, and a rear-facing fingerprint sensor. Question: How is the audio on Nokia 6 (2018)? Answer: The new Nokia 6 bears a single speaker with a smart amplifier, and Nokia spatial audio with 2 mics. Question: What is the price and availability of Nokia 6 (2018)? Answer: The Nokia 6 (2018) price has been set to EUR 279 and HMD Global is calling it global retail price. 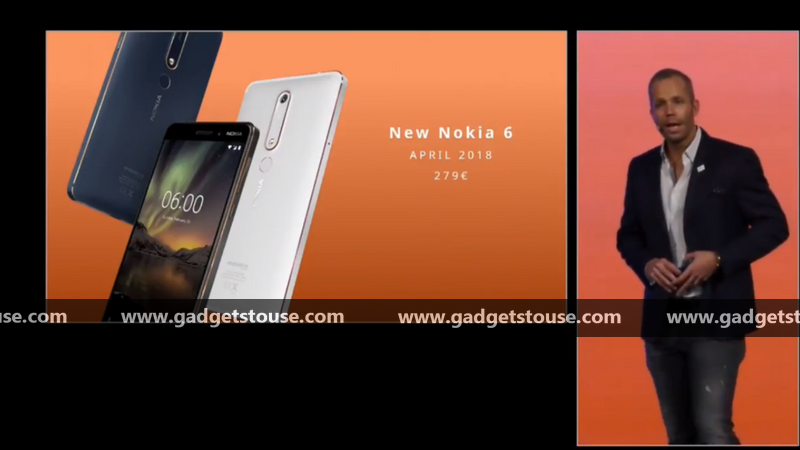 So, the Nokia 6 (2018) price in India could be around Rs. 22,000. The smartphone will go sale from early April. HMD Global has launched the old Nokia 6 with upgraded hardware and the Android One software experience. The new Nokia 6 phone comes with some upgraded features like Snapdragon 630, Android Oreo and face unlock. The Nokia 6 (2018) with its FHD display which is an old 16:9 panel in a metal unibody design looks obsolete these days. The camera sensors with Zeiss optics are also not upgraded. The good thing is that the Nokia 6 (2018) comes with Android One program of Google which brings the latest stock Android and faster Android updates for it. But, going by its pricing Nokia 6 (2018) doesn’t seem like a good choice.